/What is a Limit Switch? 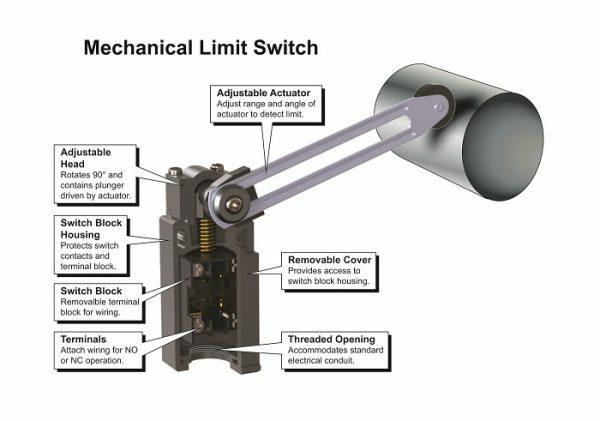 A better understanding of mechanical limit switches will help when applying these versatile devices in a variety of industrial applications. Mechanical limit switches are a common presence or position sensing device used in industrial automation systems. Typically, these switches are electromechanically operated, so they activate when an object makes physical contact with the actuator, which is often adjustable. There are many forms of actuators, each mechanically linked, from those using an adjustable head and plunger, to others with an electrical switch block inside the housing. As the actuator is rotated or pressed, it provides the mechanical action required to operate the switch’s electrical contacts, changing their state, typically using normally open and normally closed configurations of various types (Figure 1). Figure 1: A cross-sectional view of this Eaton limit switch highlights the main components of this well established and time-tested presence and position sensing device. Electrical connections are made to terminals inside the housing through a threaded opening suitable for a cord grip or conduit installation. A removable cover affords access to the connections and provides environmental protection. Most limit switches are purely mechanical in operation, using various linkages and forced movement of the object to drive the contacts. Because these contacts are heavy duty, they can switch higher currents than other presence and position detection technologies. Some benefits of limit switches are reliable detection of an object regardless of its color, shape or size—along with position accuracy and precise repeatability. Limit switches are available from course to precise repeatability down to 0.0005 mm, are not affected by ambient lighting, and can withstand harsh environments due to their rugged construction. They can also switch multiple loads and/or inductive loads, while using very little energy. Limit switches must touch an object to detect it, which is a limitation and not desirable in food applications or areas where repeated touching can damage the object. Also, because they use moving mechanical parts, they can wear out, and actuation speeds are relatively low. On the plus side, limit switches are low cost, easy to understand and troubleshoot, and often easy to repair. It is important to study the specifications and understand limit switch terminology such as maximum switching frequency, travel to operate, total travel, repeatability, force to operate, etc. With the specifications considered, the limit switch selected should be first based on environmental factors and available space, then chosen by actuator style based on the mechanical setup of an application. For typical industrial applications, oil tight limit switches are a common and good choice. A variety of environmental NEMA and IEC enclosures and ratings are available, from light to harsh duty, offering protection from oil, grease, debris, dirt and high pressure washdown (Figure 2). Degree of protection includes NEMA 3, 3S, 4, 4X, 6, 6P, 12, 13 IP40, IP67 and others. Shock and vibration should also be considered. Figure 2: These robust Eaton limit switches are suitable for harsh environments and offer a variety of actuation arm types including loop, spring lever and rotary lever with roller. A broad range of limit switches are available in a variety of configurations. The style of actuator, type of movement and object travel orientation must be chosen. Rotary levers and plunger type actuators are the most common. Rotary levers use a variety of lever actuator arms that, when actuated by the tooling, rotate a shaft to operate the switch contacts. This rotation is usually spring returned, but maintained rotation is available. Rotary lever arms often include roller levers, in a variety of configurations, and many offer adjustable length and mounting angle. Other typical levers include rods, loops (wobble head), spring rods and whiskers. Plunger-type actuators work well to detect miniscule machine motion, and they offer a smaller form factor than rotary lever type actuators. A variety of actuation methods are available including roller plunger, metal plunger (side or top push) and lever plunger. Care must be taken on how the tooling operates the roller or plunger, or else damage may occur. With lever arm actuators, a good design practice is to actuate the lever arm with a force, from a cam action for example, perpendicular to the arm. Also, depending on cam travel speed, the cam face that contacts the lever arm may need to have a cam angle. For example, low speed actuation of the lever can tolerate a cam face perpendicular to the arm, in the direction of travel. For higher speed actuation a cam angle of 45 degrees, a ramp, can help improve the life of the actuator arm and rotary mechanism. Guards to protect from accidental operator actuation of the switch should be considered, along with mounting orientation to keep water or debris from accumulating around the seals, bearings and actuator arm. A standard switch should never act as a hard stop, so protection from overtravel of the rotary lever or plunger should also be considered. Installation instructions from the manufacturer will help define best practices. Some switches, like stopper bolts, combine both a hard-stop surface and a switch in one housing, providing a good solution in certain applications. Some typical uses of limit switches are to detect flags, carriers, trollies or travelers on a machine or automated process (Figure 3). For example, limit switches can be used to detect a car chassis moving on a conveyor, a position of an elevator in a shaft, a roller coaster as it comes into the loading zone, and in many other applications. Figure 3: A very common application of a limit switch is to detect the closed position of a conveyor lift gate. Special-purpose safety limit switches provide positively operated switching contacts to verify the position of machine elements or other moving parts for safety-related purposes. A deeper understanding of limit switches opens the door to their use in many sensing applications where low cost and easy to use presence and position sensing devices are required. To read more articles about limit switches and related products, click here.